You can add as many custom pages as you like on your Magnet Commerce e-store. These could be pages with information such as returns policy, customer service, shipping etc. and will appear at the top right of your store front. Figure: Setup your e-store's custom pages by choosing "Site Content> Custom Pages" in the Administration Panel. From the custom pages administration panel, you can add new pages and edit or delete existing ones. Figure: To add a new page type its name and press "Add new". Using the buttons in the "Set order" list you can control the order in which the pages will appear on your online store. To delete an existing page simple press the "Delete" link. 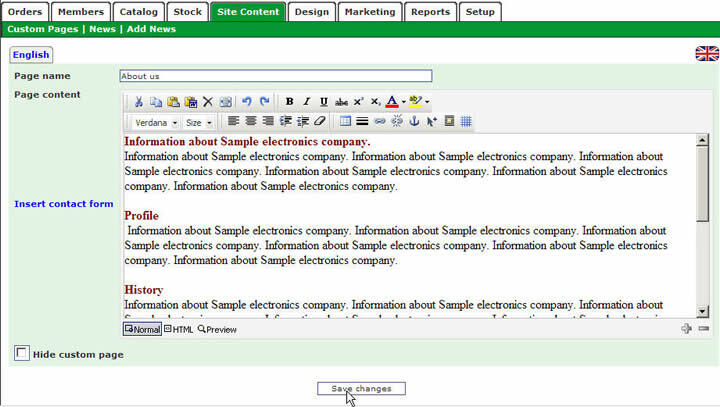 Figure: Edit the content of a custom page and press "Save changes"
 You can also view or edit the html code of a page by choosing the html view button, at the bottom of the editor.  To easily insert a contact form on your custom page, press the "Insert contact form" link. Use this functionality when composing a "Contact us" page! Once you have finished editing your custom pages press the "Save changes" button to save your page. The text editor comes with numerous options for inserting, text editing and formatting. Press the "html" button to view and edit the html code of a page. Use the "Insert contact form" link to quickly insert a form on your page. When you have finished editing a page press the "Save changes" button to save your changes.